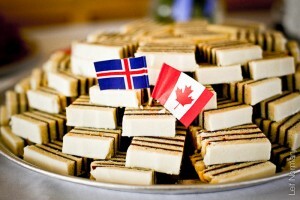 Pronounced “venur-dter’-ta”, this Icelandic torte has been a holiday classic in the Peturson family for generations. It took me years to figure out how to record my Amma’s (Grandma’s) recipe in a measurable way; her version said things like, “add enough flour to make a soft cookie dough”. This is a great recipe for sharing, as it makes 2 tortes. You can replace the traditional prune filling with other fruits if you wish, too. I tried a strawberry-rhubarb version at the Spruce Meadows Christmas Market in Calgary this year that was lovely. (You can buy it from the baker at http://www.kylescake.com. He claims to be the world’s largest baker of this stuff!) And not that we care much at Christmas, but this dessert is reasonably healthy. First, prepare the filling. In a medium pot, combine prunes with water. Place on medium-low heat, stirring occasionally. Once mixture is thick and all water is absorbed, add lemon juice. Continue to cook until mixture is like a paste. Remove from heat and add cardamom. Mash with a potato masher, wand blender or in a food processor. To prepare the torte layers, start by creaming the butter and sugar well. Add eggs one at a time, beating after each addition. Add milk and vanilla and mix with a whisk, electric mixer or food processor. Sift together 3 cups of flour, salt, baking powder and cardamom. Add gradually to liquid mixture, stirring lightly.Then preheat the oven to 375F/190C. Measure out remaining 1 cup of flour. Use this flour to knead into dough. Drop dough onto well-floured surface (it will be sticky). Knead dough until it no longer “slides” when you handle it (this usually takes about 3/4 cup). Divide dough into 6 equal parts. Roll out each part onto a floured surface (keep using your measured flour, and then use more if you need to for the remaining dough.) Dough should be about 1/4 inch thick. Cut into rounds using a cake pan turned upside down (approx. 9 inch size). Place onto an ungreased cookie sheet by rolling it onto the rolling pin and then gently rolling it off onto the cookie sheet (I use a silicone mat on the cookie sheet, and I can get 2 rounds on my sheets). Bake at 375F (190C) for 8-10 minutes or until edges turn golden. Let cool on a wire rack. Repeat this procedure with each part, saving the cut-out bits to make 3-4 more layers. Once layers have completely cooled, you can fill them. Start by stacking your layers into 2 piles, doing your best to match the sizes in each pile. You will have 2 stacks of 5 or 1 of 4 and 1 of 5. Place the layers on the counter and put a spoonful of filling on each layer EXCEPT 2 (these are the top layers). Spread the filling to the edge of each layer, and then stack them up. Place them on cake plates or cardboard bases, and wrap in aluminum foil or plastic wrap for cake to soften for serving. Let sit at least 24 hours. To serve, slice cake in 1/2 inch (1 cm) slices and cut each slice on the diagonal to create 3-4 pieces for the middle section (2 for the ends). HINT: When you try this on your guests, don’t tell them the filling is made from prunes. Many people are not keen on prunes, but seasoned with cardamom they take on a whole new twist).